According to a popular medieval legend, Mary was exceedingly pious and insisted on being educated in scripture at home by her mother before she was to enter the Temple. Thus she became well versed in Hebrew scripture. As we shall see she made excellent use of her Bible lessons when the Angel Gabriel arrived. 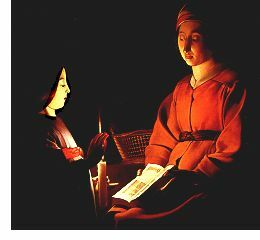 In this version of The Education of the Virgin by Georges de La Tour (or possibly his son, Étienne), we see St. Anne, Mary's mother, holding the Book while Mary attends to the flame. La Tour is particularly associated with nocturnal scenes and the use of a candle as the light source in a painting. In his maturity he handled his themes with subtlety and somber grandeur. Our attention is focused on the four points of light: the scriptures, the candle and the faces of mother and daughter. How better to sum up an education devoted to simple piety? This article is copyright 2002-04 by Joseph Phelan. Please do not republish any portion of this article without written permission.